Union Trust weddings are always a special treat to photograph. 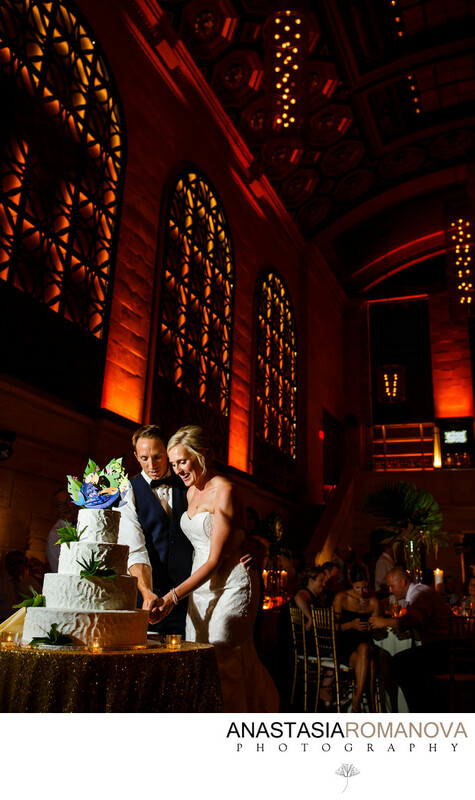 This one of a kind wedding venue is one of our biggest favorites in Philadelphia. Maybe simply because it resonates with our photography style so well. Dramatic. Vibrant. Dynamic. There is probably no any other wedding venue with such a unique architecture, unique backdrops and gorgeous ambience. Caroline and Steve started off their day at the Hotel Monaco Philadelphia, their wedding ceremony was held at Saint Augustine's Catholic Church with their reception following at Union Trust. It was a beautiful celebration filled with lots of laughter and happy tears, wild dancing and touching speeches. It was such an honor to see and document all the family members and friends gathers together to share the happiness and joy of the newlyweds. As you can see on this photograph, the wedding cake is featuring a unique paper cut centerpiece of a toucan from the Lion Kind Disney cartoon that matched the rest of the themed decor. The bride did a tremendously hard work creating all the decor pieces like wedding invites, placing cards, bar signs all by herself and I've never seen anything diy look so unique, stylish and polished. To evenly lit the couple with the cake and leaving the rest of the guests in the dim background, we used an off-camera flash to the camera's left. ISO 640; 35mm; f/3.5; 1/100 sec.